The first-ever WNBA All-Star Game that was contested outside of the more usual East vs. West format resulted in a 119-112 victory for Candace Parker’s team at the Target Center in Minneapolis, Minnesota. 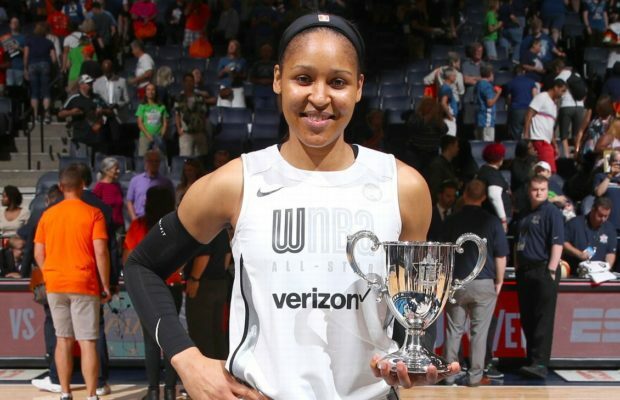 When the All-Star Game’s 2018 location was announced for the Twin Cities – the home of the Minnesota Lynx ,one item of speculation was would Minnesota’s favorite daughter – Maya Moore – make it a three-peat of All-Star MVPs. Her 18-point, eight-rebound, six-assist outing answered those questions with a resounding yes. To just be fortunate enough to be in positions to continue to win, to be playing well, to be healthy, to be here, and obviously to do it here in front of our home fans, friends, family is so special and it makes it even more special. If one needed any further confirmation that Minneapolis is a Grade A WNBA town, all one had to do is look at the stands. 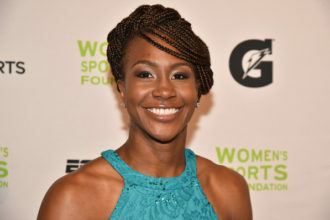 Moore claimed her third All-Star MVP in front of a sellout crowd of over nearly 16,000 at the Target Center. The turnout was beautiful to look around. It just felt good in there. I think people were just really excited to have it here at a fun time, having – especially having Rebekkah [Brunson] there, having four of us was really special just to have another All-Star. She must be doing something right if reporters are asking her questions about her storage space in terms of her basketball trophies. 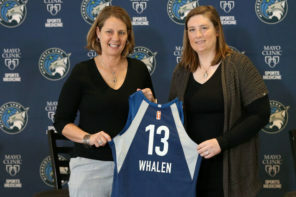 Because of the new format where teams get drafted by the top two vote-getters, the four Lynx could have all been one team or possibly split between the two teams. Moore and Brunson were part of Team Parker while Seimone Augustus and Sylvia Fowles were drafted to Team Delle Donne. Moore was not the only who finished her All-Star outing with 18 points. Allie Quigley, who won her second consecutive three-point shooting contest – and did so in unforgettable fashion – also came up with 18 points – including four three-pointers. Skylar Diggins-Smith added 17 off the bench and probably garnered some late MVP votes down the stretch. Seven of her 17 came in the fourth quarter. There was also no shortage of highlights from Liz Cambage of the Dallas Wings. Not only did she score 11 points and eight rebounds, but played a little bit of the one and two in addition to the five. Then again, we are talking about the same Liz Cambage who dropped a WNBA record 53 points on the New York Liberty not too long ago – so she can play whichever of the five positions she wants. For the Team Delle Donne end of things, its namesake finished with six points in over 21 minutes. Around halftime, it appeared as if the Las Vegas Aces rookie A’ja Wilson would make her push for the MVP trophy. She finished with 18 points. Parker’s team particularly had to keep a close eye on Delle Donne’s Washington Mystics teammate Kristi Toliver. She led all scorers with 23 off Team Delle Donne’s bench, but 15 of those 23 came in the fourth quarter, likely upping her MVP consideration late. Toliver also managed seven three-pointers, tying a record for any All-Star Game. 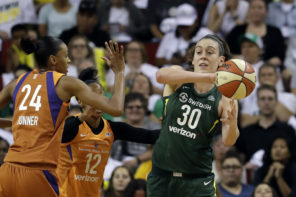 The early leader in the clubhouse for that MVP honor may have gone to Breanna Stewart – a much-ballyhooed name for consideration of the regular season MVP award. Six of Stewie’s 10 points came in the first quarter, which at its conclusion, saw Team Delle Donne leading Team Parker 31-27. Augustus finished with 14, the Phoenix Mercury’s DeWanna Bonner added 13, and Wilson’s Aces teammate, Kayla McBride scored 11. The game itself was full of headlines and memorable moments, but one of those came prior to tip-off itself when this powerful and moving open was seen on the ABC telecast which was narrated by Billie Jean King. With this year’s All-Star Game in the books, the anticipation is already building for next season’s festivities. At Lisa Borders’ pregame press conference/State of the WNBA address, she announced that the 2019 All-Star Game will take place at the Mandalay Bay Events Center and will be hosted the Las Vegas Aces and MGM Resorts. Thank you to the Minnesota Lynx organization and the city of Minneapolis for hosting our 2018 #WNBAAllStar game! The crowd was amazing. The level of play was unbelievable. And that three-point contest was crazyyyyy good. This year’s pair of captains were optimistic about next year’s All-Star festivities emanating from Las Vegas – and even quipped about how the All-Star introductions would be done in a very showman-esque style that would be pure Vegas. I don’t know if it’ll matter. Kidding, of course. I think there will be a different method of picking if we know the All-Star Game is in Vegas. Yeah, definitely a different method of picking. Who’s going to hitting the streets is how we’re going to be picking. Speaking of which, a Vegas All-Star Game means that Wilson will indeed be the face of next year’s festivities as she will be in the midst of her second season in the W.
Already thinking about 2019 #WNBAAllStar? 2) and frequent coverage, the support of the city and the state, to the energy fans brought to the practices and game, THIS WAS AN INCREDIBLE EXPERIENCE! On behalf of @minnesotalynx players and staff, THANK YOU from the bottom of our hearts 💕.